In most homes, there seems to be at least one room that's always too hot or too cold. Regulate that room's temperature easily with the Thru-Wall Room-to-Room Fan, a variable-speed, in-wall ventilation system that moves heated or cooled air quietly and efficiently from a comfortable room to a stuffier one, saving far more energy and money than installing space heaters or window air conditioners in these uncomfortable rooms. 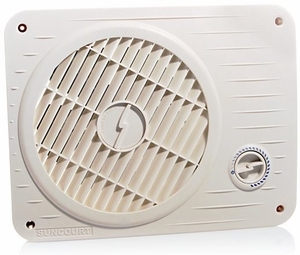 The Thru-Wall Room-to-Room Fan installs in any frame wall from 3.75" to 6.5" thick. The 360-degree rotating grille can be painted to match your room's d�cor. At high speed, the Thru-Wall Room-to-Room Fan moves up to 200 cubic feet of air per minute, 100 cubic feet of air on low speed. Simply turn a knob to adjust the speed. You can also adjust the rotating grille to change the airflow direction according to your comfort level.